Frankly Vic | UK Photography + Lifestyle Blog : In 2013 I will 'choose"
I'm not a big fan of New Years resolutions, I prefer to set goals rather than resolutions - something more tangible and with a shorter time frame. This year I'll be continuing to set my goals monthly - I did this all through last year and it worked so well for me. Even bigger things need to be broken down & I find it easier to keep motivated about things if they're short term (tiny attention span much?!). I also find that it encourages me to break down the 'big' things into smaller, more manageable tasks because I don't like to set goals that I have little chance of accomplishing. Something I'll also be doing again this year is choosing One Little Word that I want to keep in mind for the whole year. Last year it was quite obvious to me what I should pick - I felt like I'd got myself stuck in a bit of a rut and the best way I could see out of it was to 'go for it' a bit more. This year... This year I struggled to choose a word - many came to mind but none of them felt quite right, they didn't fit with my vision of this coming year. This is going to be a year of big adventures and big decisions. Big, big decisions. So this years word is choose. Elise, one of my favourite bloggers used 'choose' last year & I really loved how she incorporated it into her monthly goal setting with text on pictures. One of the things I wanted to work on this year was keeping more of a personal record on this blog - when I read back through my posts from last year I noticed a shift towards more personal posts and it was so much nicer to read back over. So this year I'm (aiming) to share my goals & report on progress - both as a record and for accountability purposes. 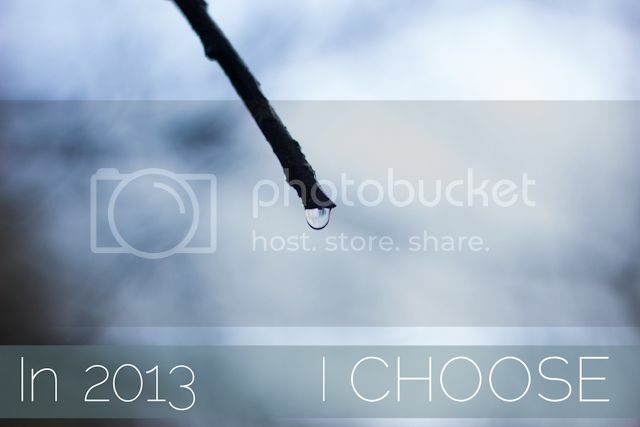 This year I choose to choose. It's a gentle reminder to myself that regardless of what happens, I can always choose how to respond to it. I really like this idea of 'one little word.' I would much rather get goals then resolutions as well. I set 13 goals for 2013. I have a feeling this is going to be a good year. I do a word for the year too, it's definitely nicer than resolutions! Choose is a great one, mine for this year is "friends". Also, hello new blog design!! I was a bit slow on the uptake there, it looks amazing!! Great job! i set goals and choose words but this year i did a vision board. This is a really nice idea - I may use this idea for my first post of the year after a lengthy blog hiatus! I love this idea! Resolutions can be such cruel things, making choices seem much better. Excited to see what 2013 brings for you.